With an increasing amount of mobile users Carlow University wanted to update their existing site to become more mobile friendly. I was brought on as a contractor to elevate their current website design and to make sure that prospective and current students could get to all the information they need quickly on both desktop and mobile. In addition to updating the functionality of the site to be user friendly on both desktop and mobile Carlow University also wanted to update their color palate. In 2011 Carlow went from being an all women university to coed and they were concerned that their current palette and website design appeared too feminine and was alienating prospective male students. To combat this I choose to darken a few of their secondary colors and to add an earthier maroon to make the site to appear more gender neutral. In addition to the colors we updated the font family being used on the website to a thick slab serif which struck a nice balance with the more feminine brand colors. I took a lot of inspiration for the redesign of the site from the design work that Carlow’s web team was already producing and updating on slideshows on their current site. Overlays and diagonal lines were featured prominently and gave the design a lot of personality. 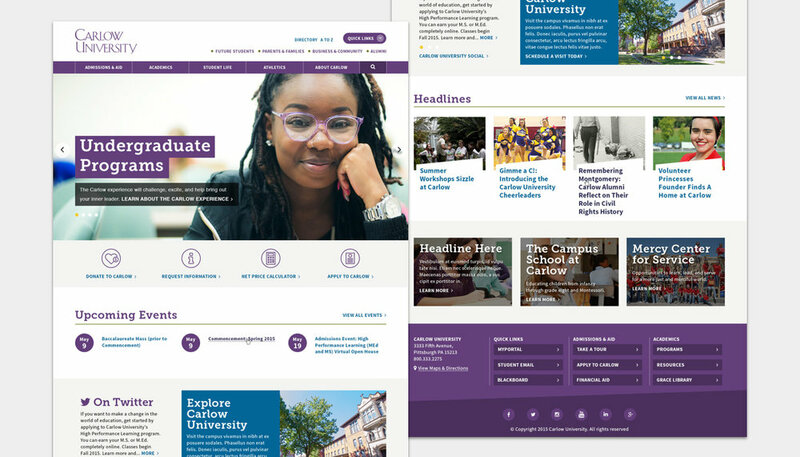 The design and web team behind Carlow wanted the homepage to be be constantly updating and showing new activities and events to current students but they also wanted to make sure prospective students were able to find what they needed with clear call outs to request more information and to apply. Carlow University has a phenomenal graphics and web team behind their website and we wanted to give them as much flexibility as possible when it comes to creating pages. We implemented a multi call out system that can appear at the bottom of every page as well as a multi column system where the team can split the main content block into as many as three columns to help section out information. This helped them grow the website without hiring outside help and without breaking the design.